It’s been a good week now, and we have had over 700 responses to our survey. Firstly, a huge “thank you” to everyone who took the time to participate! The results are interesting, and here we go…. That’s a pretty good turnout, especially considering that the survey was in English, and that we only asked on English watch forums to help us with the survey. So, an even bigger thank you to everyone who filled in the survey in a language that wasn’t their mother tongue. The huge number of countries also shows that we didn’t just hit a certain group of customers, but that a very broad range of Swiss watch owners took part in the survey. This is also very comforting, as it shows that a broad range of owners took part. The split between brands (lots of Omega, Rolex, Longines, …) shows that this is a realistic sample of data. With over 700 surveys filled in, that’s what we were hoping for. We have everything here, from a single watch to a collection of 2400! The average number of watches owned is 32.8, so it looks like most people who took part in our survey are collecting watches. No surprise, as we recruited through watch forums, and through our site. Of those watches owned, the average of Swiss watches is 24.4 watches, so quite a few watches out there are non-Swiss, but nevertheless, over 2/3 of watches owned are Swiss made, or their movements are Swiss made. The average value of the watches owned by our survey participants is EUR 26,000, with the maximum value of EUR 2,000,000. Looks like we hit a vein of very serious collectors there, which also makes the average watch owned worth around EUR 810. All very realistic data, and no sign of any trolling or skewing. Part of asking these questions was to see if the survey data was realistic, or if people were just filling it in arbitrarily to make a point. It doesn’t look like this is the case at all. The average yearly spend on servicing and repairs is EUR 860, with a maximum spend of EUR 30,000. If we check this data for sanity, it’s looking good again. Assuming that out there in the real world, a watch gets a service every 10 years, the average intervention (service or repair and service) costs EUR 260. All very realistic, and the further we delve into the data, the more comforted I feel that we haven’t collected nonsense data. 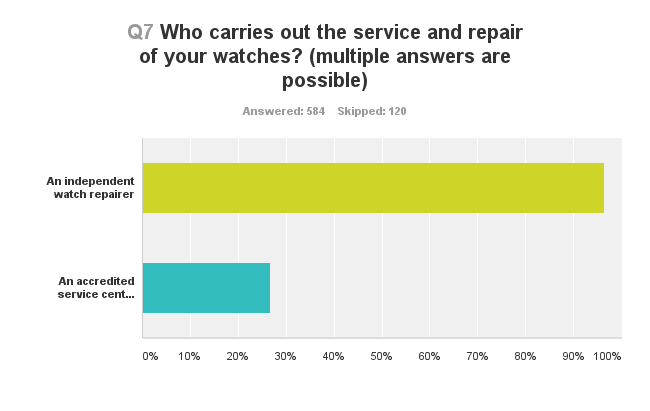 A clear response here as well, with 96.4% using an independent watch repairer, and 26.7% using the manufacturer or an accredited service centre. 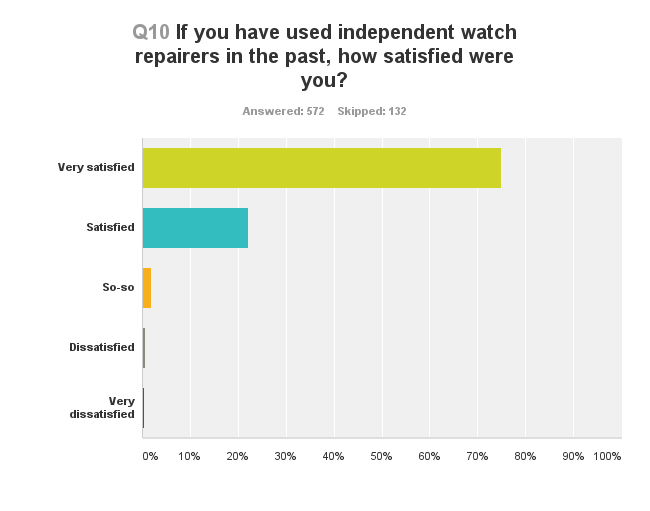 So in real life, independent watch repairers hold the majority of the market. By far. The numbers don’t add up to 100%, as people use of course both. Now here comes our first surprise! Full marks throughout for the independent trade, and this couldn’t look much better. Even though we expected that we would get good “grades”, we didn’t think that we independents would shine so bright! Surely, the manufacturers and their service centres have to do at least as well, especially considering that they tend to be roughly twice as expensive as we are. This completely took us by surprise. 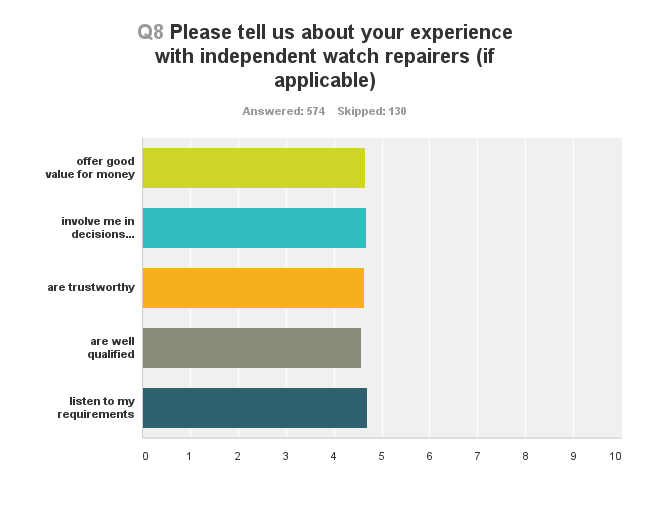 We have been told that independent watch repairers don’t get parts from the manufacturers because we can’t guarantee a quality standard, and here we are hearing that the overall qualification of service centres is lower than ours! Never mind the value for money, and the rest. 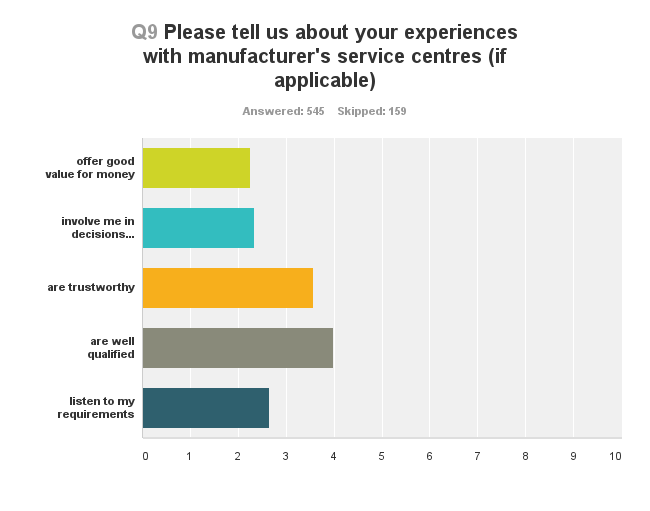 Independents are far better in every category and the manufacturer’s service centres. Yes, there were 2 people that were very dissatisfied, and I’m sorry to hear that, but out of 572 answers, that’s not too bad. Now for the service centres. Ouch. I would call that a wipe-out. Again, manufacturers tell us we can’t have parts because we aren’t up to scratch, and only their accredited service centres can give customer satisfaction. Really? 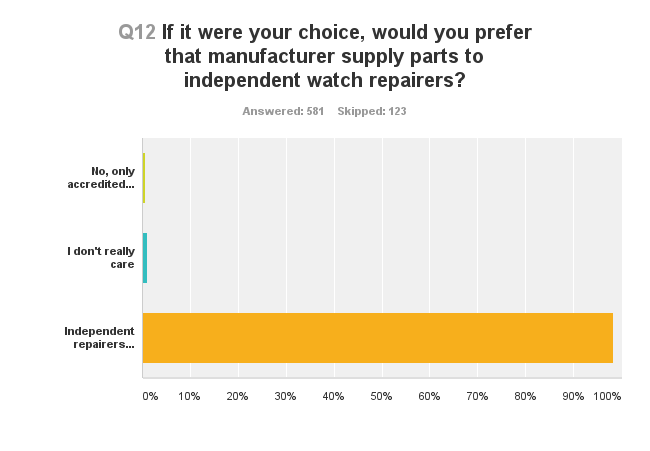 So, do the survey participants think that independent repairers should have access to spare parts? Ah, yes, it looks like it. 98.3% of survey participants would like that. But will all this have any impact on the Swiss watch industry? Maybe yes, as a lot of people aren’t willing any more to buy watches for which spare parts aren’t freely available, and they are considering taking this into consideration when they buy their next watch. 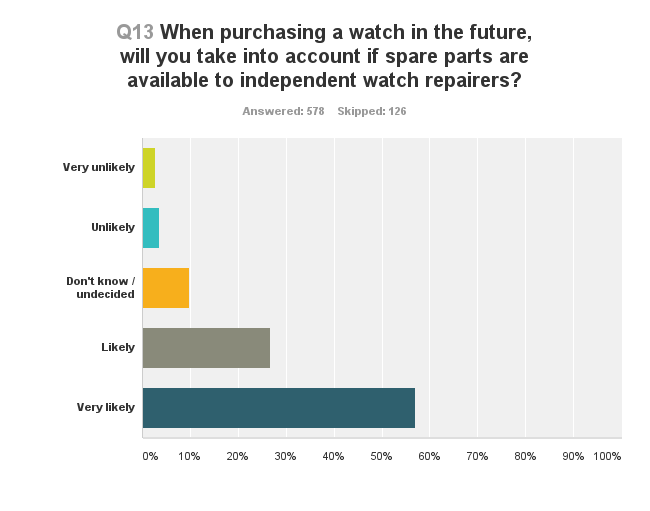 Over 83% of participants are likely or very likely to consider the spare parts situation when buying their next watch. Interesting. Now for the individual stories (best and worst of independents and service centres). Everyone gets their fair share of a kicking, but again, the service centres come across as not caring too much, and just carrying out the work they think they want to carry out. Especially collectors are upset that all sorts of things get changed and polished, which they never wanted. There are failures of independent repairers as well, but again, we get a lot less flack than the service centres. There isn’t really enough room here to post all the submissions, but this will be part of what we will pass on to the Federation of the Swiss Watch Industry (FH) later. As we said before, the email addresses will be kept a lot better than the TalkTalk customer data, and we will not pass that on to anyone else. We will only ever use that if our data set gets questioned, and only allow checking individual sets with the permission of the person that submitted the data. A very clear picture emerges here, and that is of an industry that doesn’t listen to its clients. It’s time to wake up, and find a compromise that suits manufactures and clients evenly, and that isn’t skewed towards manufacturers that exercise as much power as they can. It’s 2015, and it’s time to wake up to the smell of the power of customers in the age of the internet. If you feel that the FH should know about this, why not tell them what you think? You can contact them at http://www.fhs.ch/eng/contact.html, and I am sure they will appreciate how you feel about the spare parts situation. We will get in contact with them next week as well, but a bit of nudging won’t hurt at all. If anyone would like to check the data and make sure we haven’t fiddled with it, I am more than happy to give out the raw data set, but of course without the email addresses of those who supplied it. Just contact me. I bought a new Omega on the basis of parts availability and reasonable service but wouldn’t buy another on the basis of their unreasonable change of mind on spares. Make sure that Omega knows that – send them an email, please. Having been trained by the BHI and serviced Swiss watches on a hobby (and, briefly, semi-professional) basis for over 35 years, I am firmly of the view that the more affordable Swiss watches* (especially the more modern ones) are nothing special and certainly have no particular technical merits that could justify the silly retail prices for many of them. In terms of technical-bang-for-your-buck they represent spectacularly bad value for money. It seems that most customers are seduced by the branding, and are not particularly well informed about the merits of the mechanism itself. This suggests that, whilst most Swiss watches are technically uninspiring, the Swiss are outstanding at brand marketing. As a result of their policy towards spares supply, combined with their poor value for money, I now never recommend Swiss watches when friends and family ask for advice. The Japanese brands have been interesting and quite innovative over the past few decades, and in my view are significantly under-rated in terms of technical merit. So far I’ve had no problem buying spares directly from the UK importer, which is very gratifying. Thus I now recommend buying a Japanese watch when asked. In the sub-£100 bracket, the Chinese mechanical watches also represent good value for money. Thanks for the very professional survey which showes and confirmes the expected results. However to show the results to the FH or the European Administration will change nothing. We have had already a conversation with the german cartel authority on that subject and they just told us, that there will be not enough public power and interest behind to start activities against the relevant companies. A premium watch is a luxury item just for luxury people and not for the normal citizen. Quite a strange argumentation I think. We are still in talks with the UK government, and are seeing some movement. The UK is very much a free market country, just like the US. In the end, the customer has to be educated, and it would help to work on that side, too. A nice article in “Stern” just in time for Christmas, telling people the hidden cost of buying that Omega for Christmas might be a good idea? Great summary Christian! Hopefully this has some impact when you share it with the industry folks. We asked from “very dissatisfied” to “very satisfied”, with 5 graduations. So this is the weighted average according to SurveyMonkey. I wonder if you have interpreted this correctly. How does SurveyMonkey map the five-step scale from “very dissatisfied” to “very satisfied” onto the x axis of the chart? Is it definitely 1 – 5? Or 2 – 10? If it is the former, then those two charts need altering so the x axis goes up to 5. If it is the latter, then it would be wrong to claim “full marks” for anyone. At the moment those two charts are at best ambiguous, and at worst misleading, and I urge you to correct them. It’s called a “weighted average” of the 5 possible responses, and the difference between the satisfaction level with accredited service centres and independent watchmakers is quite pronounced I would say …. Thanks for your reply, Christian. However, whilst I understand what a weighted average is, I would still urge you to clarify whether the x axis should go from 0 to 5 or 0 to 10. The issue isn’t the weighted average, but rather the mapping between the five available choices and the numerical scale on the x axis. I agree that the difference is pronounced, but are the independents REALLY almost “full marks”, or are they actually getting less than 50% satisfaction, as the graph would suggest? It’s an important difference, I’m sure you’d agree. ….which doesn’t feel right, but that’s what the graphs seem to show. Sorry – just to be clear: the weighted average requires the five choices to be mapped onto five numbers first. Then the weighted average can be worked out. It is essential to know whether those five choices were mapped to the numbers 1, 2, 3, 4 and 5; or 2, 4, 6, 8, 10. The former seems the most likely, but the scale on the x axis suggests the latter. Thanks again, Christian. I am satisfied that the independents did well. I’m merely concerned that if you use those graphs as they are, they may mislead the very people you are trying to persuade. Anyway, SurveyMonkey have indeed assigned the numbers 1 to 5 to the five possible responses: “strongly disagree” gets a 1, and “strongly agree” gets a 5. On that basis they have calculated the weighted average correctly, and have scaled the answer so that it cannot exceed 5, but have INCORRECTLY plotted it on a scale going up to 10. This is definitely an error by SurveyMonkey. There is another shortcoming: a reader might assume that – being numbered from 1 to 5 – the scores are all positive. This is a bit like an exam: everything you get right earns you some points, and (in most exams) everything you get wrong is simply ignored – you don’t lose points. In your survey, a supplier getting “disagree” scores from every customer would still score 2 out of 5, which doesn’t sound too bad and is, in fact, a pass mark in most exams! A better way would be to assign negative scores to the “strongly disagree” (-2) and “disagree” (-1). “Neutral” would get 0 and the positive remarks get +1 and +2. That way the service centres would get a score clearly on the “wrong” side of zero – a very unambiguous message! Anyway, if you don’t fancy rejigging the numbers, I would suggest that you simply crop those two graphs at 5 on the x axis if you choose to use them in any documents. This is totally legitimate: the maximum possible score is 5, not 10, so the graphs will then be correct. Hello Christian and Mitka very interesting survey with some surprises. I was amazed at the shear amount and value of some people collections, surely built up over the years having trust and faith in the watch manufactures. Like many who took part in the survey my core collection is Omega trust levels built up over the years helped by the Omega vintage data base and the availability of spares. My love grew from vintage watches then because of gained trust it evolved for me to purchase a brand new omega Speedmaster Professional. Now I feel I have had the rug pulled out from under my feet, I recently wrote a email to Swatch to express my views and had no answer so much for customer relations. Then two weeks later emailed Omega, the replied with a stock answer and offered a chat on the phone with a customer relations person. Thank you for taking part in the survey, and for posting here. There is quite a bit happening behind the scenes here in the UK, and I hope that we will get somewhere within the next half year. I guess like many, you have a smallish stock of spares that shortly you will not be able to replenish. Are there any calibres that are going to be difficult to overhaul because of spares, or do we all have a number of years before Swatches policy starts to have a real effect? I think there is a bit of time left, as lots of people have stock. EBay will still remain a good source for spare parts for quite some time, especially for vintage watches. We are trying various avenues here, including contacts within the UK government, press work, and legal action. This will take a bit, but we are doing all we can. Thank you for your efforts on this Christian. Very interesting that Omega is the most-owned brand in the survey, and it’s their parts that will be restricted. A lot of owners will be hit by this, in addition to the watchmakers. I have an Omega (and two automatic Sekio’s) which I would be very happy to have serviced by Christian or Mitka, but would probably not buy another of that brand now on principle. Hopefully they hear how future sales will likely be affected, and change their mind – even if only for commercial reasons. A terrific result. If it wasn’t clear before (which it was), it’s resoundingly clear now. Maybe you guys could consider extending the survey to a more international forum in the future? As a side note, it looks like you’ve got one hell of a customer base! Polite and respectful message sent to FH via the link you provided.